We are about 9 weeks and counting down. We have invited friends with H1s. I hope they can join us, great folks. So, who is really coming? Count me and my GF in. Dunno if we are taking the J10 or the Waggy. Kinda leaning towards the waggy because it has more room, but I dunno if I trust the engine... The J10 is always 100% ready for an extended trip, but no room since it's a truggy on 42's. Thanks Blake, good to hear you & gf will be there. We have not made any motel arrangements yet. You camping or lodging? Well I was thinking about camping, then going into town to shower up ever couple of days. That's what we usually do. Well, I blew the outer axle shaft on my wagoneer over the weekend. It has a life time warranty so I should be good there but it's going to take up to 8 weeks to process the claim. It looks like I'm out. Outer shafts are pretty universal, unless you have a really custom setup. I could bring you a couple of outers if you want. I also have a ujoint tool that makes pressing the ujoints much easier. Was hoping you were saying you are in Ryan. Busted stub shafts are part of the Moab experience too. Seen them changed out on the trail. It's not so much the availability of the shaft. It the warranty process. The website says it may take 8 weeks to process. I took lots of time off work, so I'm pretty flexible. If I have someone to 'wheel some hard stuff, I will most certainly take the J10. Wife and I are coming. J10 won't be ready ( ) so her JK will have have to suffice. First timers for Moab, anything we "need" know/expect prior to coming? If She Gets Half My Stuff, Can I Keep The JEEP? It's only a 6 hour drive for me. Still planning to drive the J10. Thinking about leaving Longmont CO on the morning of Wednesday the 18th. Will anyone be going through Colorado on I70 that day? I haven't ruled out going yet (pending TBI install). I would probably leave on Weds as well. lol, very true, i have done Moab half a dozen times or so ,carb'd, in three different FSJ's. What I should have said is that I was planning on taking this year off but I am excited about doing the TBI swap and if I can get it done and tuned before Moab I may go to test it out. I was hoping to do my SOA/SF too but I am having trouble finding some parts and I don't have all the parts yet. Last edited by srobertsfsj : 03-02-2012 at 09:06 AM. Well I hope you make it! Would be cool to meet ya and drive there with ya! The part I am having the hardest time finding is axle shafts for my HP D44. I have an 8-lug setup from a 78 F-250 that I want to swap in while I am doing the SOA/SF but it didn't come with the front axle shafts. Well I actually have all of those parts, but I would have to strip my waggy to give them go ya. That FSJPARTS guy has the HP D44 shafts. He wants $150 plus shipping for them. You can make the drag link out of DOM and use some ES2010L and ES2010R TRE's, assuming you get some arms off ebay made for chevy 1 ton. I'm prolly gonna go with discs on the waggy soon and will give you the stock D60 brakes if you want them. I will be hitting the yards on Saturday, looking for those shafts. If I find them, I would loan 'em out to ya. Thanks for the offer on the brakes, if I haven't found any by the time you convert I might take you up on that. Rims are fairly cheap so I will probably wait until I get close to doing the SOA/SF. Question for ya, do you know if 15" rims will work on these axles? 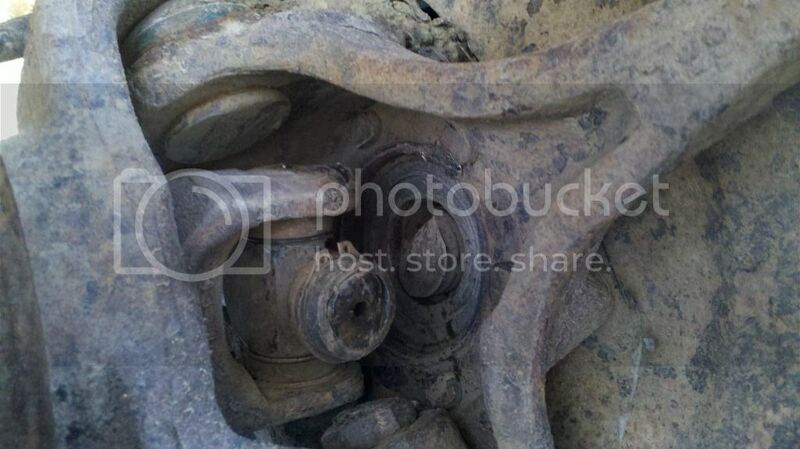 I believe a stock F250 8-lug was 16". Would save me some serious $ if I dont have to buy new tires too. Unless a miracle happens and I win the lotto I doubt I will have the SOA/SF done before Moab but I will definitely have it done before Ouray. I plan on selling my 6" Hell Creek springs to help offset some of the cost. Right now I am concentrating my efforts on the TBI since I have pretty much all the parts.